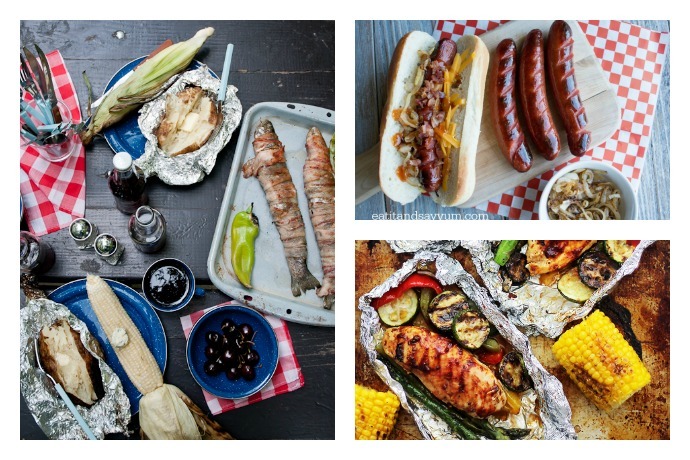 15 camping recipes so good you'll really want to go camping. I have a love-hate relationship with camping. There’s something really wonderful about it: The kids have an unimaginably good time, we sleep cozy together in a tent (air mattresses are a must), and we spend the whole day outdoors. The downsides? Dirty bathrooms, bugs, no hairdryer, and everyone makes fun of me for wearing makeup. All in all, though, it’s a fun thing to do—once a year. For me, the most fun part of camping is the food, of course. I love how primal campfire cooking is and, over the years, have learned how extensive and delicious it can be, too. These awesome camping recipes for every meal of the day go way beyond hot dogs and are proof that you can you can keep it gourmet while in the great outdoors. You know, if you want. And, yes, if you make me sleep on the ground, I definitely want. The Campfire French Toast at This Lil Piglet is pretty genius. The recipe calls for egg substitute, but I don’t see why you couldn’t use this smart cooking method using real eggs. 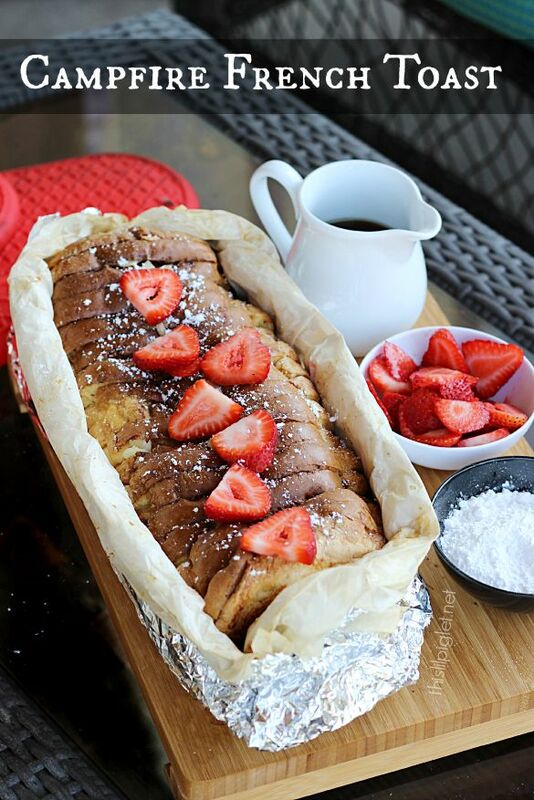 You just have to make sure to bring a bowl and whisk to prep the eggs before pouring them over the bread. That is, if you’re driving directly to a campground. If you’re actually hiking and camping out you should probably stick with the substitute. 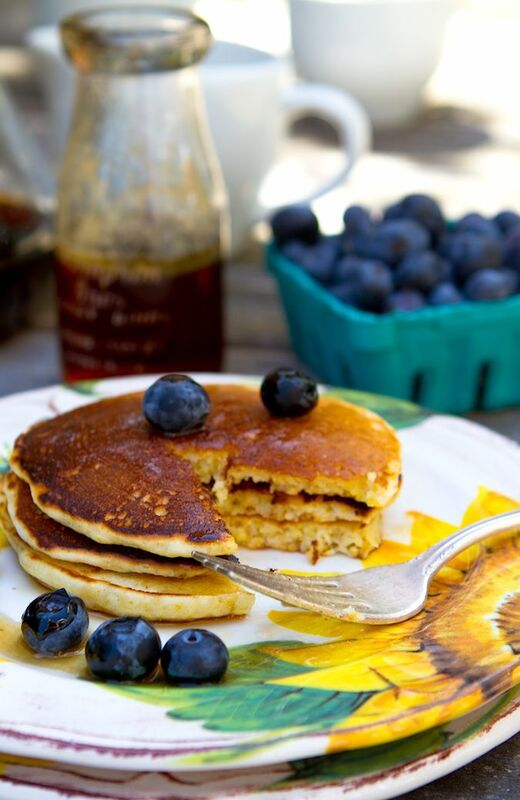 The recipe for this Cornmeal Griddle Pancakes mix at Chez Us calls for 5 pantry ingredients and can easily be made ahead. Then, at the campsite, combine the dry mix with milk, eggs, and some melted butter while the griddle heats up. That’s it. 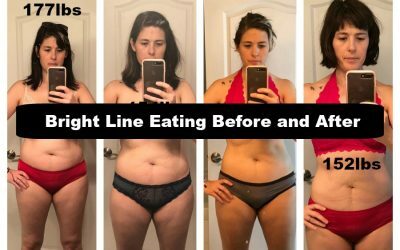 So easy and totally worth it. 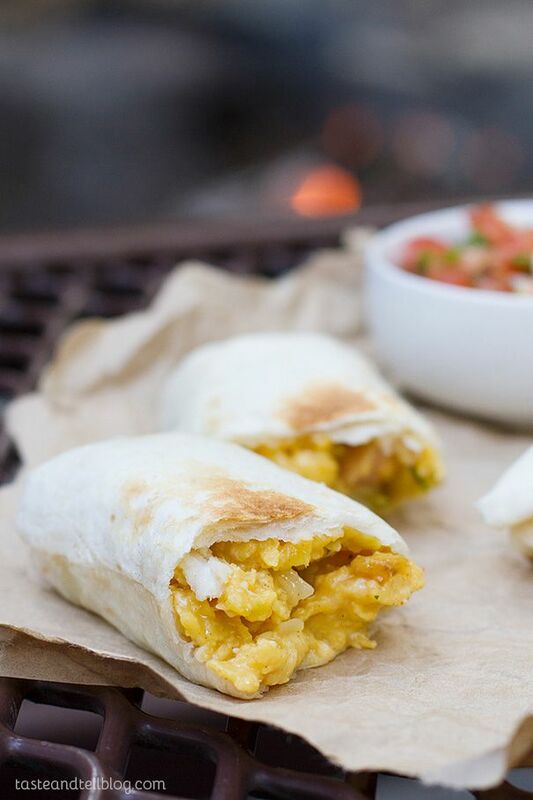 While camping, I find that it’s best to load up on protein and carbs to fuel a busy day, and these Campfire Breakfast Burritos at Taste and Tell help you do just that. This recipe calls for hash browns, taco seasoning, and green chiles. If you want something more straightforward—like eggs, cheese and maybe some ham—go for it! You can still follow these instructions. It isn’t usually worth starting a fire for lunch, especially when cold cuts or a good old-fashioned PB&J can do the trick. But, if you’re going to light a fire, you might as well light it to cook up these Cowboy Hot Dogs at Eat It and Say Yum. I said that these recipes go beyond boring hot dogs and, believe me, this recipe does! 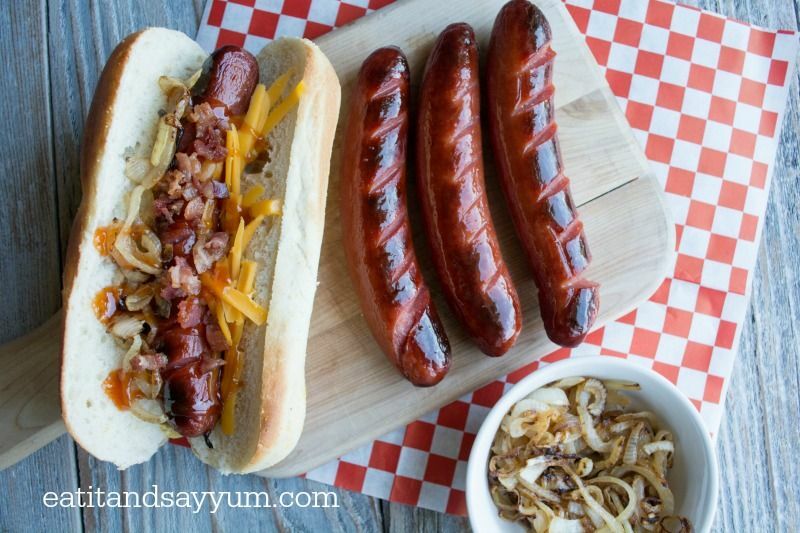 It calls for caramelized onions, bacon, cheese, mayo, mustard, and an easy-to-make hot dog sauce (though you can substitute BBQ sauce) to make one spectacular dog. However if you’re going to start a fire for lunch cooking, the lunch food better be worth it. 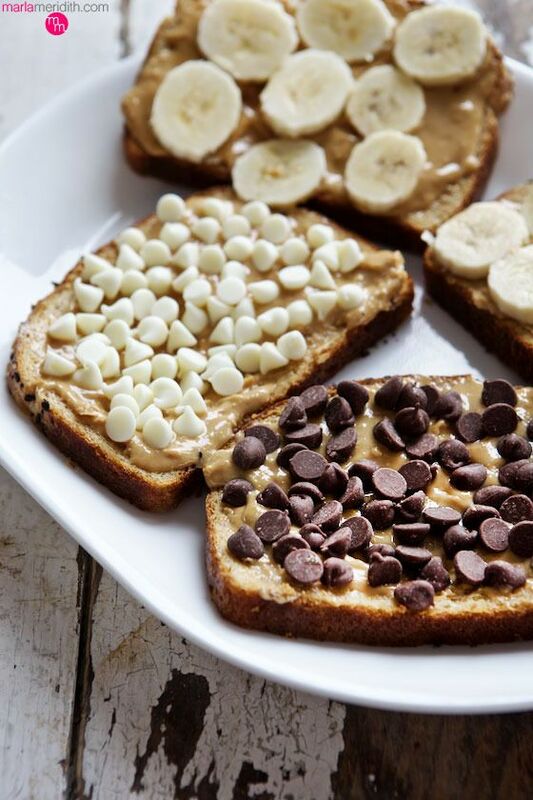 I think that these Chocolate Peanut Butter and Banana Paninis at Family Fresh Cooking are very worth it. These make a classic sandwich something special, especially for the kids, and camping is the perfect time to serve them. Plus, I think you’ve earned the right to add chocolate to your sandwich if you’re pitching tents and starting your own fires. We still love this Bacon Wrapped Trout recipe that we originally spied at Design Mom and shared last year. It can be made with any butterflied fish though trout is always a favorite. 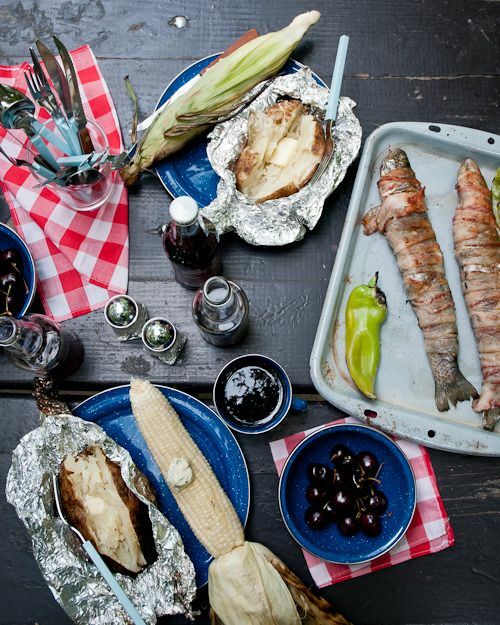 And, while the fish is the star of the meal, you can also find recipes for the whole tasty camping menu including how to make campfire baked potatoes and fire-roasted chiles. Yum. These Quinoa Paella Foil Packs at Ricotta and Radishes are genius. Measure and wash the quinoa before you go, when you’ll also measure out the rest of the ingredients — or at least the chicken stock; the rest can be eyeballed easily. Then carefully make the packets at your campsite. Delicious! 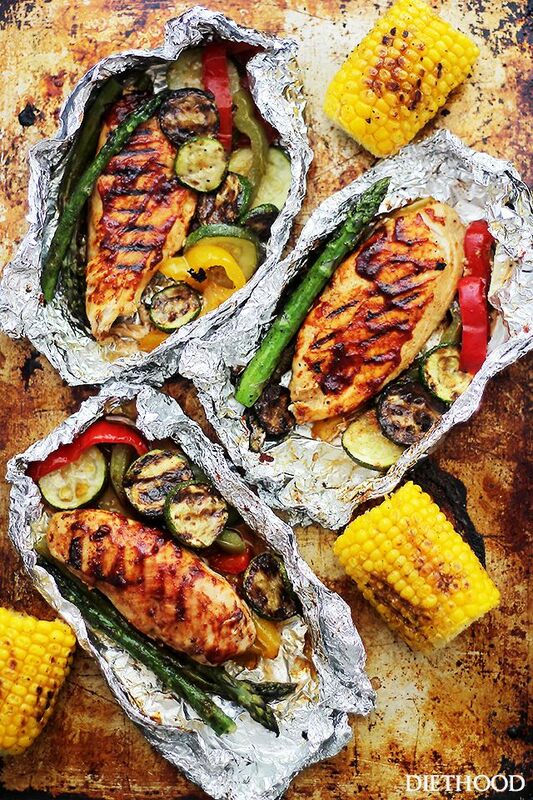 This Grilled Barbecue Chicken and Vegetables in foil at Diethood couldn’t be easier. Pile on the ingredients, brush with BBQ sauce, wrap, and cook. You’ll like this so much that you might end up making it at home in the oven—there are directions for that, too. If you’re camping with a big group or have, um, selective eaters among your group, this Mix-In Mac-and-Cheese idea at Parents is genius. Cook pasta ahead of time and pack along with milk, butter, shredded cheese, and mix-in’s. 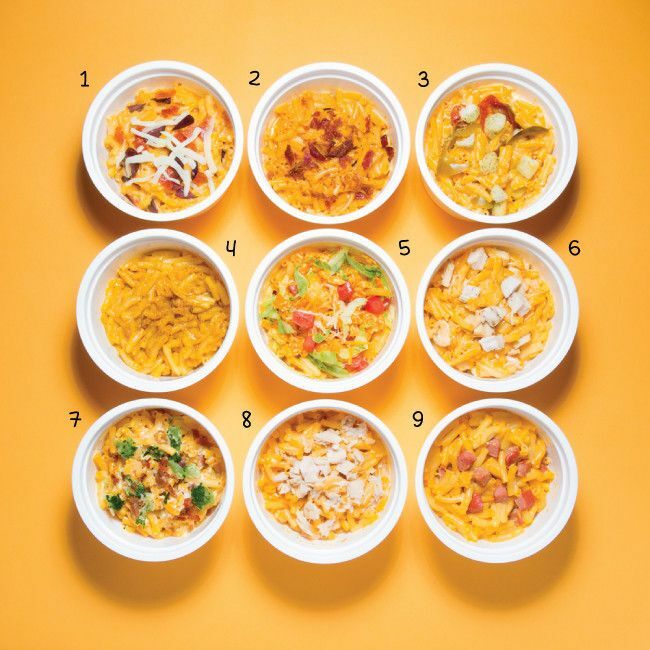 They give ideas for kid-friendly mix-in’s, but I also love these mac and cheese upgrades at Huffington Post (pictured). Then follow the easy instructions at Parents on how to cook it all up so that everyone can enjoy a personalized dish of macaroni and cheese at the campsite. It’s kind of hard to suggest desserts for camping when there’s really only one dessert to be had: S’MORES! But these Upside-Down Cakes at Food Network are too good not to mention if you want something a little more sophisticated. What a great idea! 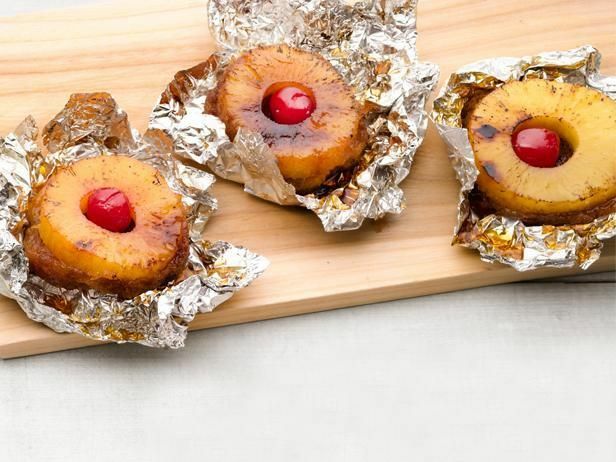 They are part of a list of 50 things to grill in foil which is worth checking out. There are tons of recipe ideas there that are excellent for camping. 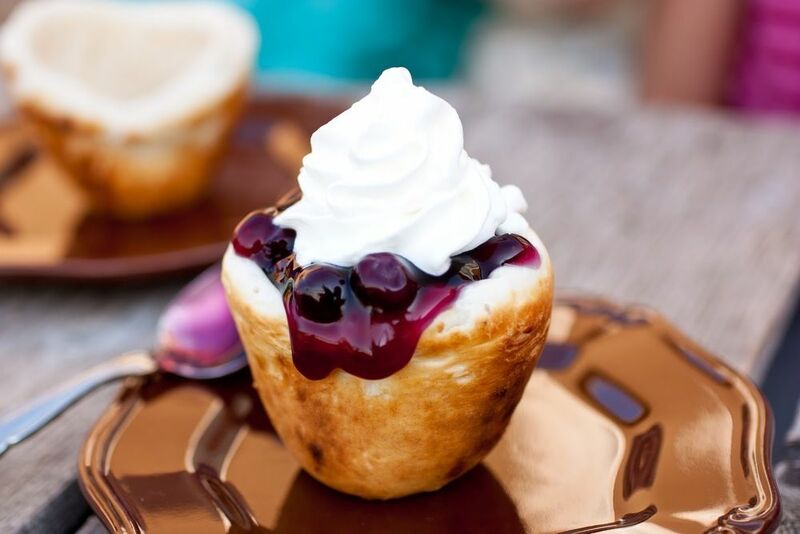 These Easy Campfire Tarts at Cooking Classy are also worth a mention because the recipe calls for easy, store-bought biscuit dough, pie filling, and whipped cream. The recipe suggests that you need special equipment to make these, but I bet you can MacGuyver a way around that. (You’re camping, after all!) Also, if you ask me, it’s worth whipping up homemade whipped cream or even an easy pie filling before you go. That will make these wayyyyyy better. 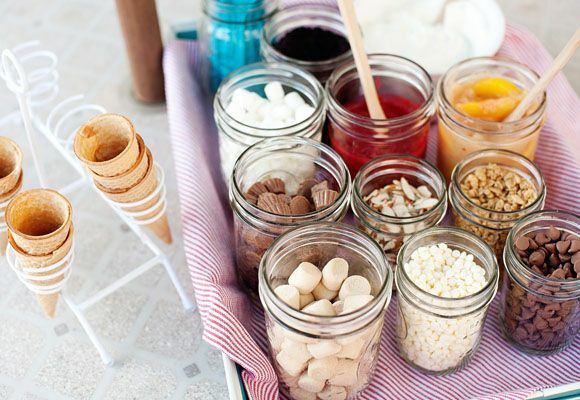 Alright, so s’more aren’t the only classic camping dessert, there are also campfire cones. While the traditional approach—ice cream cones stuffed with chocolate chips and marshmallows—is good, you can upgrade your campfire cone game with an easy Peach Sauce and these campfire cone filling ideas at Tablespoon. Who knows, maybe you can come up with a combo that will knock s’mores out of there top campfire dessert spot. Probably not, but it’s worth trying. Related: Party-ready s’mores. Enough said. Most snacks that you bring camping are not made over a campfire (hello, potato chips) but there are a few notable exceptions. Like popcorn. But not just any popcorn. 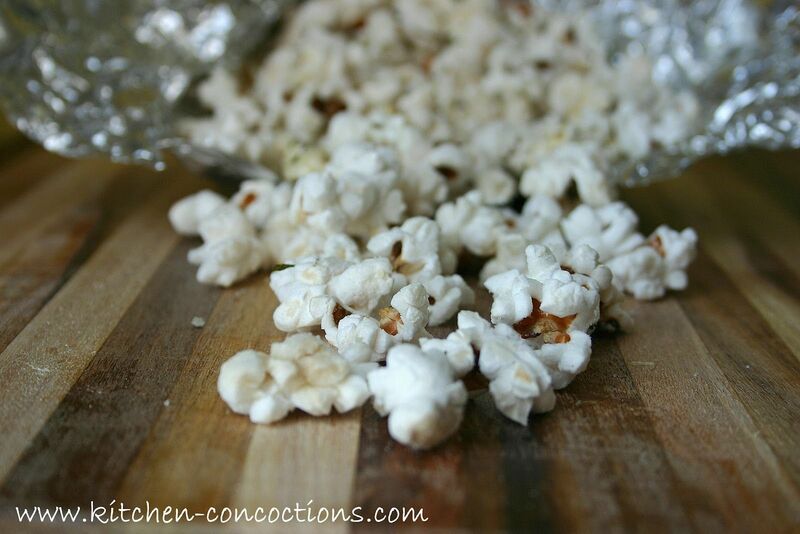 We love this Campfire Parmesan Popcorn that we found at Kitchen Concoctions. It’s delicious and the perfect late night treat to make after the fire has eased down, but the embers remain hot. 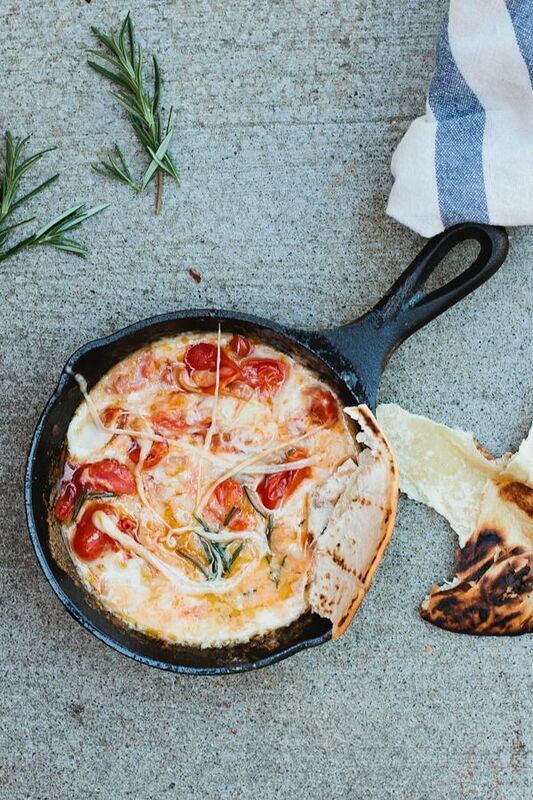 Learn how to whip up this campfire melted cheese dip with tomatoes and shallots at Craftsy. The recipe calls for fontina, but any great melting cheese will do. Serve with flat bread and enjoy with an end-of-the-day beer or a glass of boxed wine (which isn’t so bad anymore, you know). This is quintessential camping foodie goodness. 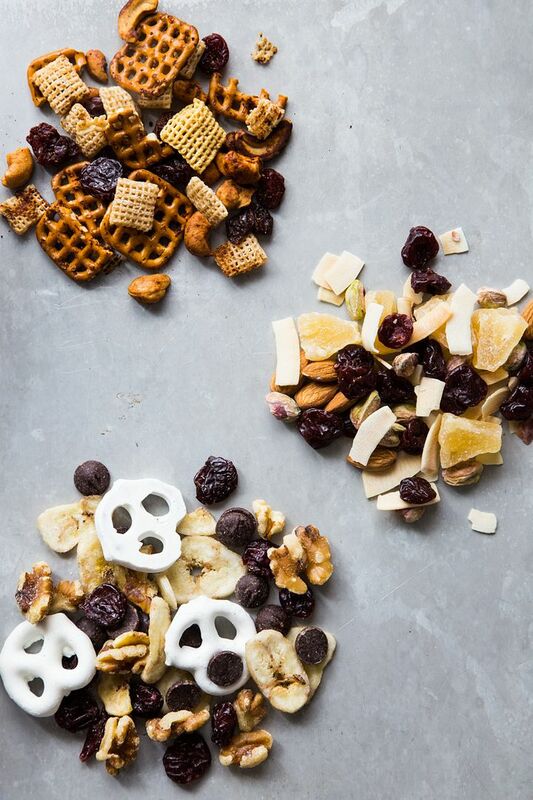 Though not a recipe to cook over an open fire, I had to include this Tart Cherry Trail Mix from Jelly Toast because, well, trail mix is an essential while camping. The recipe can be personalized a million and one ways. In fact, the recipe on the site comes with three variations—tropical, south of the border, and banana split—which each sound so good I can stop right here. Thanks for making such a tasty recipe. I already went camping once this summer (enough for me! ), so I’ll be making these at home. Ha! 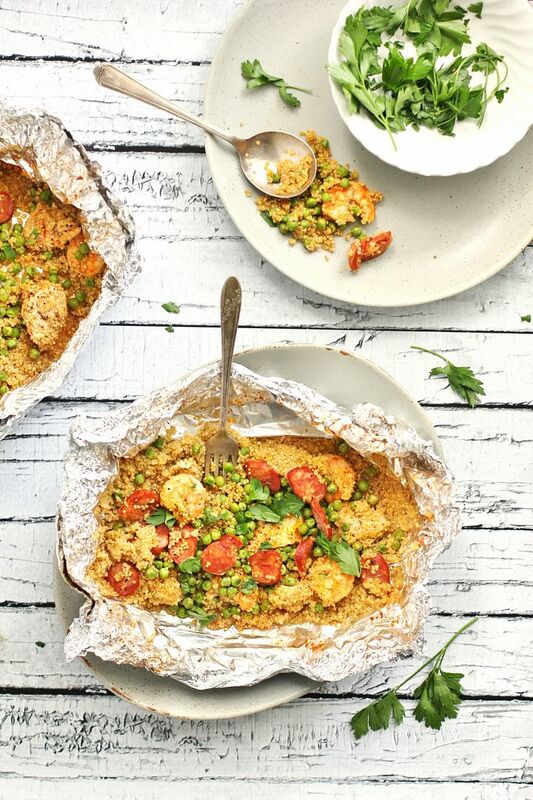 The Quinoa Paella Foil Packs recipe doesn’t talk about cooking it over a campfire. Will it still take 30-40 minutes while cooking directly on the coals of the fire? It seems like it would burn. The instructions are for over a grill, so we’d definitely suggest having a grill top to place over the campfire. Also, since it suggests indirect medium-high heat, cook these over a smaller fire or as it’s winding down — this is not the thing to cook when the campfire is raging, for sure!